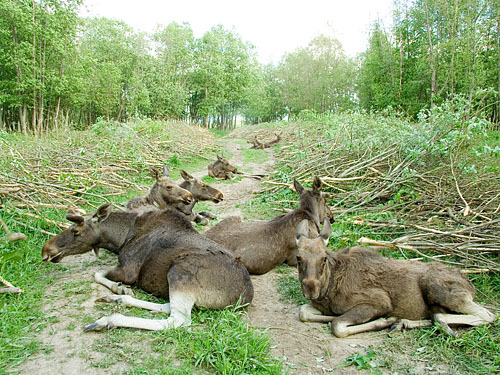 From mid-January to early April all moose stay near the wood-cutting area. Every morning every moose has a breakfast. Locking moose in cages prevents accidents on the woodcut place. When both logging and oatmeal are over, animals are released and walk to piles of branches and troughs full of aspen bark. There's no need to build fences around the wood felling area. 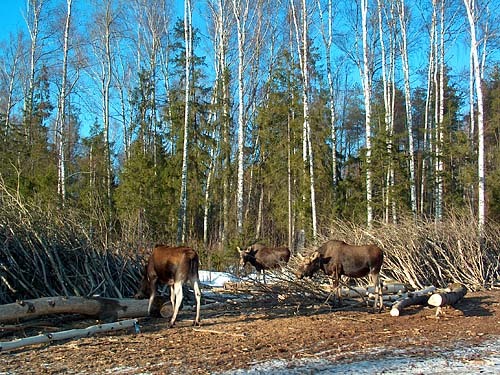 Food abundance holds domestic moose and also attracts wild moose from adjacent forests. Though human can't give them a wide food diversity, animals can browse in the forest and find plants they need. In spring, while the snow is melting away, all pregnant cows should be moved into the 3 hectares «maternity home» enclosure, and all others – to the 4 hectares «exhibitional» enclosure. Dairy-moose are privileged to be released soon after parturition. They spend relatively short time confined in the enclosure. 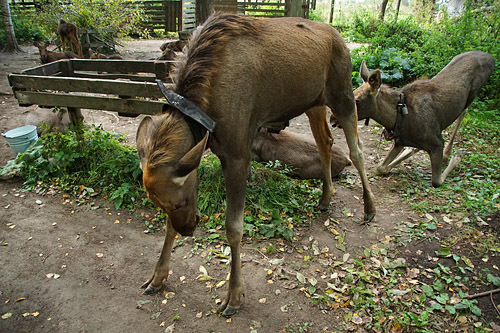 The freedom of Luchik and Yaston, «stud-moose», «alpha-males», was not restricted at all, but they were not in a hurry to be free and walk to their «Berendey Thicket» beyond the Poksha river. Until a green grass in fields and leaves on trees become abundant, they didn't «ask» to let them out. Moreover, being expelled from the enclosures, they returned in minutes and proceeded to piles of aspen branches and willow twigs or troughs full of aspen bark. After appearance of green food, they only sometimes visited the enclosure once a day to eat oatmeal. 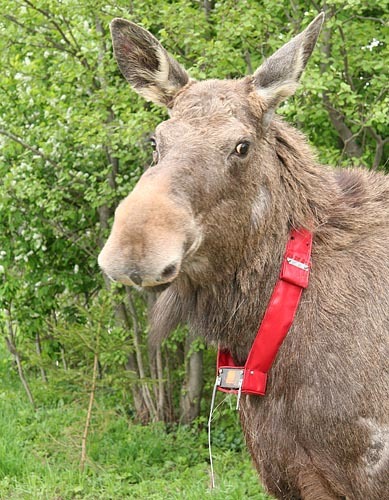 In June they «disappeared» till the autumn rut period, but there was no problem to find them in the forest using a portable radio direction finding receiver, because every adult moose has a radio transceiver attached to a collar. Every night the GPS transceiver sends the yesterday's track to the server. You can view the "demo" track of Naka who lived in the Elk Island National park here . In spring young males and barren females are placed in an exhibition enclosure. 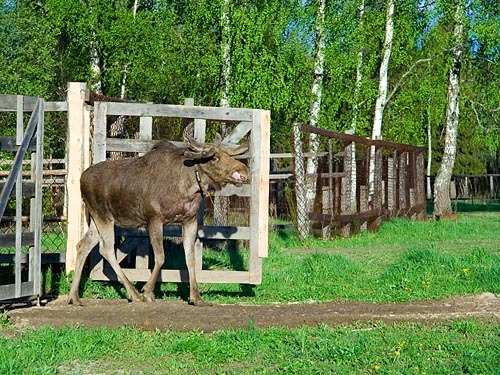 According to standard method of keeping moose, these animals should be released in mid-June, i.e. after the end of the so-called spring-summer period of migration activity. In the wild nature, young moose are dispersing from mothers' home ranges looking for less populated areas to form their own home ranges. 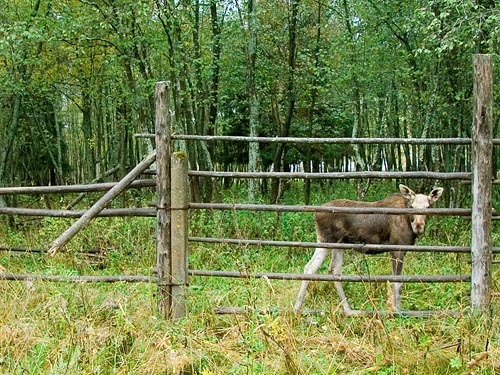 So, in spring young moose are to be kept in enclosures to prevent emigration. In summer they are confined only for visitors to see them. Otherwise visitors would see only newborns. Milch moose spend their daytime on the forest pastures or in milking barns, and their encounter with a tourist group is a happy chance. My opinion is: it is necessary to release a half of young animals in mid-summer. I believe they will return to eat oatmeal or to hide from gnats in a dark shed; therefore they may be released alternately. Radio tags will help to control their movements. 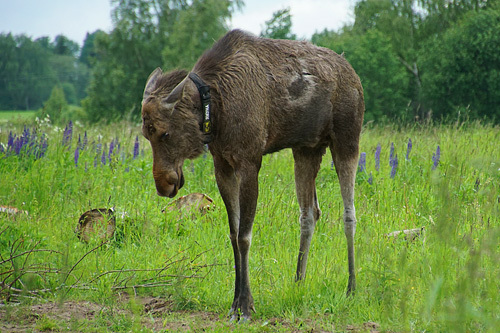 During the hot period all moose suffer hard from gadflies. Wild animals hide in dark spruce thickets or in the water. Spruce thicket saves only partially because it is not dark enough. Domestic moose are ahead of wild ones: they can hide in dark shelters and sheds. I put forth an idea to build a shed divided into two parts with a Rabitz net. 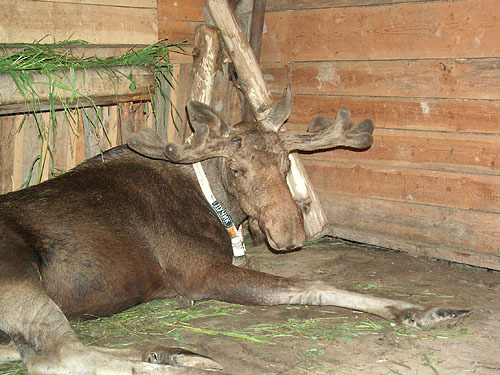 Moose can enter one part of the shed, visitors - the other. But the director ordered workers to build only a sun-awning for visitors instead of a dark shed and to make a curtain to shield animals from light. The guides often forget to draw curtains after the excursion, so young moose suffer from gad-flies. Nevertheless, young moose are not imprisoned completely till next winter. Some young females will be provided with GPS+GSM transmitters and released during the autumn rut period. Others must release themselves. 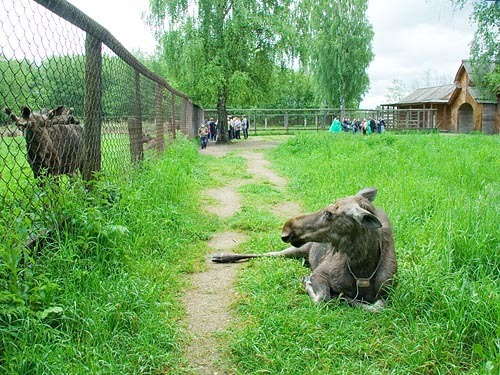 The fences of the enclosure, except Rabitz type «front» ones, facing visitors, are made of wooden rails. A moose can break them if really wants to. I saw a wild moose breaking a birch tree measuring 12 cm through. Frightened by a long rope attached to her harness, a milch-moose cow ran through 4 fences in under a minute; then she seemed to be unharmed. Every autumn during the rut period wild males break fences of the exhibition enclosure to mate with young females. Domestic yearlings and 2 years old animals sometimes damage fences almost inobservably to get to the agriculture plants on adjacent fields. Luchik and Yaston have learned to jump over fences; a yearling calf Lubok – to belly crawl under the fence. Next morning they all appeared inside the enclosure during oatmeal dispensation. Perhars, creepholes to the freedom save the remount herd from gastrointestinal diseases. 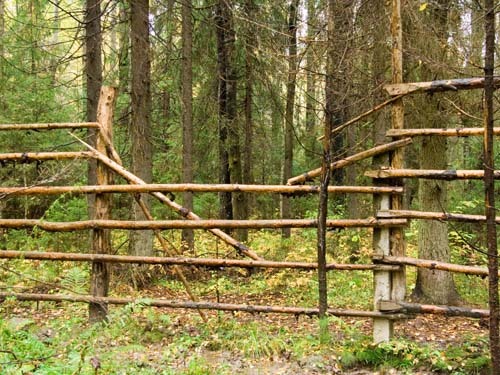 After mid-summer the farm workers do not repair fences as thoroughly as during the spring-summer period of migratory activity. In the early winter all free ranging animals have almost full-weight feeding on the farm in addition to oatmeal and browse. 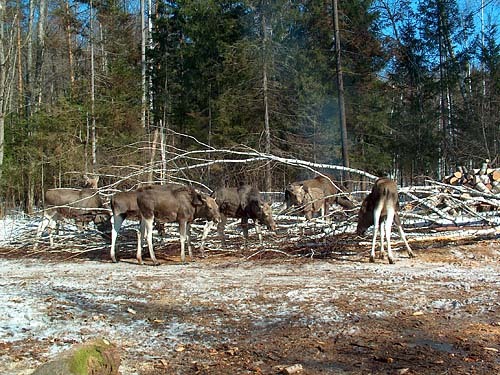 When the snow cover becomes thick, all animals are led to the wood-logging place. Young animals can find some deficient plants which they couldn't find in an enclosure. Now they have one more chance to leave the farm. A moose stays on the farm while he likes to live here. Animal Liberation Front has nothing to do on the Kostroma farm. All domestic moose sold themselves for oatmeal. But they are in dilemma: almost all other territory on earth belongs to hunting grounds. The number of animals who left the farm only a little bit exceeds the number of killed here for meat on the previous years. Only some outstanding persons being the farm administrators (directors), dared to kick free «redundant» moose in spite of ranking administrators and some farm workers demanding meat. 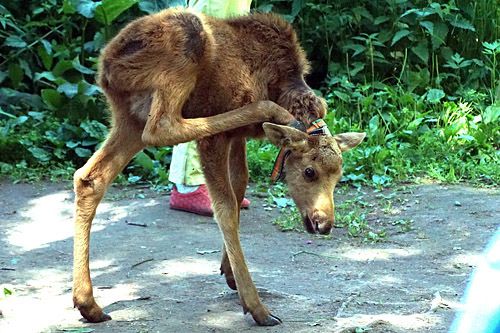 Vladimir Gotovtsev didn't command to kill domestic moose at all. Sergey Brovtsev after one kill was gained over by dairywomen; they convinced him of possibility of a peaceful coexistence with animals. Currently, a living moose is much more expensive than meat from him, thus some of redundant animals are still alive and waiting for purchasers. If no buyer comes, they will be killed because a principle «take at least something» excused by words «better we'll eat than poachers» prevail in the current administration. But though a free moose has a chance to be killed by a poacher, a legal hunter, a wolf, to die in a car accident or for another reason, he will be gladdened by life, maybe, for long years. 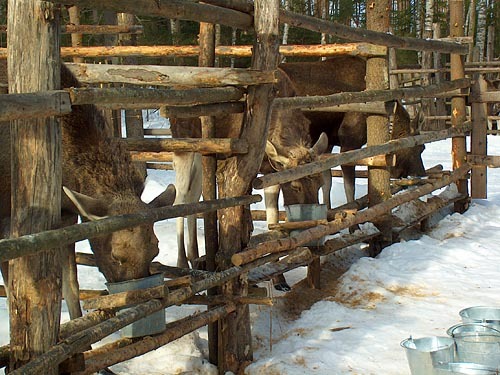 For those who want to learn more about methods of farm moose raising and keeping, a «methodical recommendations...» brochure (also in English) is available in the Library section of this site (1). It was issued in 1984, and some improvements in moose keeping were made later. Please read my notes and comments on the last pages. An author's film «Moose, a domestic animal. 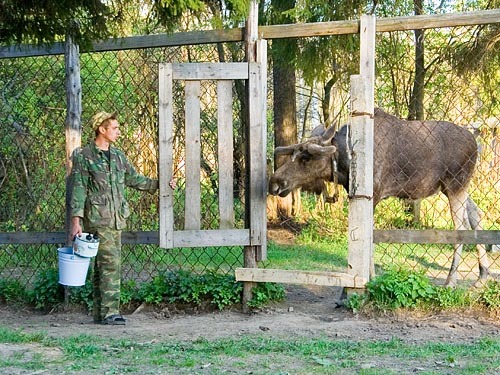 The Kostroma moose farm», all about life on the farm, is available in English (DVD, 90 min). 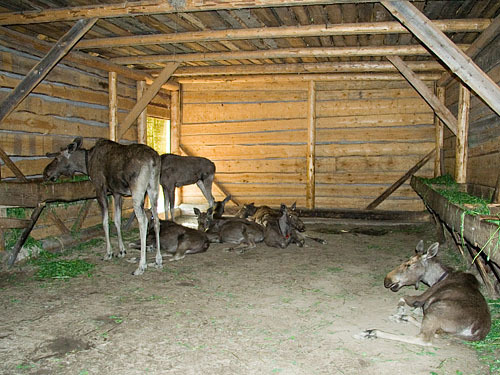 The basic book on the moose farming was written by Eugene P. Knorre and issued in 1961 in the Pechoro-Ilych Reserve. It is available in whole on my site, but only in Russian. Unfortunately, some of the latest «scientific» publications calling to establish «meat-and-skin» moose farms, are copied from Knorre's books issued in 1950-s – 1970-s. A reader can compare and find a lot of plagiarism. Radio position finding electronic devices used to keep free-ranging animals. We began to use radio tagging in 1980 to help dairywomen to find moose cows who «forget» about milking and to assure scientific observations in the natural environment (2). The transmitters and receivers were self-assembled. Since 1990 all animals older than 1 year are radio tagged. In the latest years we succeeded in making a new generation of tags on the basis of microchips. In addition to simple UHF «radio beacons» we designed radio collars with GPS modules which collected information about animal position and Thuraya satellite transceivers which sent this information to my celuular phone as SMS-messages. We were bound to use Thuraya instead of Argos because license to use Argos was too expensive for Russian scientists. Using Thuraya doesn't need a license; a transceiver is cheaper than Argos; the cost of service is significantly lower. On the other hand, Thuraya needs more heavy batteries because its satellites are geosynchronous. Thuraya has no global coverage, but works fine in Kostroma region. An everyday message included 1 to 5 positions with interval 4 – 8 hours, activity data (moving-not moving) with 10 minutes interval and accessorial information (temperature, battery voltage, expected position accuracy HDOP, etc.) The device had a built-in «beacon» for radio direction finding, so we could find an animal in the forest. The GPS+Thuraya tags were tested and worked about a year on the moose farm, and later we delivered them for use on European bison in Kaluga Zaseki Nature Reserve where cellular phones didn't work in 2000-s.
Because the Sumarokovo reserved area is now covered with cellular GSM network, we decided to make GPS+GSM tags to replace GPS+Thuraya. GSM module is lightweight and needs less power, so we can take 1 lithium battery instead of 4. The cost of service is 5 times lower, price of the GSM module is 20 times lower compared with Thuraya, collar mass is 3 times less. The number of everyday locations is up to 24. All other features are the same as in GPS+Thuraya. The device also has a built-in «beacon» for radio direction finding. We started to use such tags on domestic moose in Elk Island national park (see section «Other moose farms...»), to study European bison in the Kaluga Zaseki Reserve, National Park Orlovskoye Polesie and Klyasma-Lukh reserved area, and even horses in Tver region. Now every milch moose of the Kostroma farm sends me position and activity data. Five wolves living near the Toray Lakes have GPS+GLONASS+GSM tags, too. A "demo" track of a moose cow who lived in Elk Island National Park near Moscow is available here . 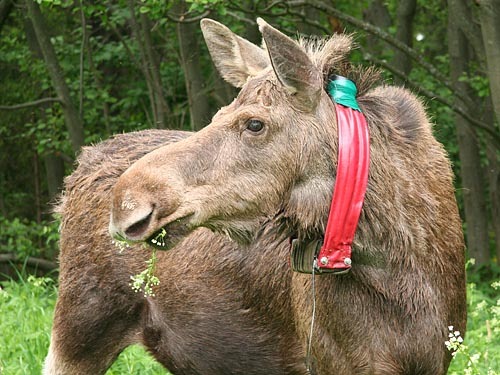 Since 2005 we also use GPS loggers to study farm moose movements. Loggers give more detailed information about moose movements than GPS+GSM, but it takes time to obtain it from moose collars. A GPS logger takes the position every 1-30 minutes and records it on an EEPROM memory chip. Time after time, with 3-20 days interval, we replace storage batteries and EEPROM to transfer data into a computer. All electronic circuitry and software of these modern devices are developed by Alexander Purikov. The server is developed by him together with Sergey Titov. In Russia this set of radio equipment is less expensive compared to foreign analog (Telonics, Televilt...) animal collars, because can be used in Russia without very expensive permissions and licence. It can be used on domestic animals like horses or cows which are kept free ranging. 1. Dzhurovich V. M., et.al. (1984). 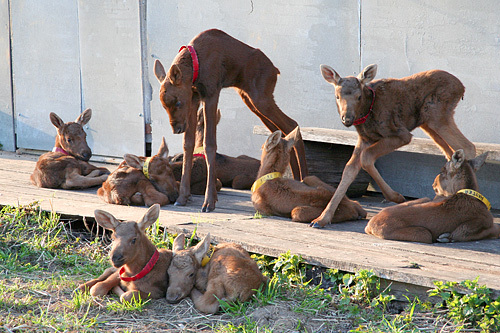 Methodical recommendations on moose calves raising, moose cows keeping and milking. Regional printing house, Kostroma. See in the Library section (in English).